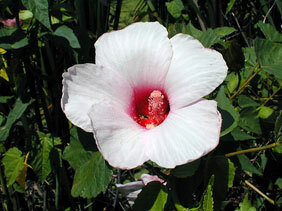 Also Called: Crimson-eyed rose mallow, swamp rose mallow. Stems: Erect, covered with fine star-like pubescence or nearly glabrous. Leaves: Alternate, simple, lanceolate to ovate, to 9 inches long, 1.25 to 3.5 inches wide, (about 2.5 times as long as wide), unlobed or middle and lower blades obscurely lobed; upper surface dark green, glabrous; lower surface covered with fine star-like pubescence; margins coarsely to shallowly toothed; bases rounded to nearly heart-shaped; tips tapering to points; stalks slender, up to 2 inches long. Inflorescences: Solitary flowers in leaf axils; flower stalks jointed near or above middle, fused to subtending leaf stalk for portion of their length. Flowers: Calyx subtended by 8-12 bracts; sepals more or less united; corolla 4 to 8 inches wide; petals 5, white or cream-colored with red or purple bases; stamen column about 4/5 inch thick, bearing anthers along sides; style about 2.5 inch long. Fruits: Capsule, egg-shaped, 1 to 1.2 inch long, mostly glabrous, tapering to an erect beak, enclosed by the enlarged, persistent calyx. Habitat: Marshes, swamps, and wet meadows.